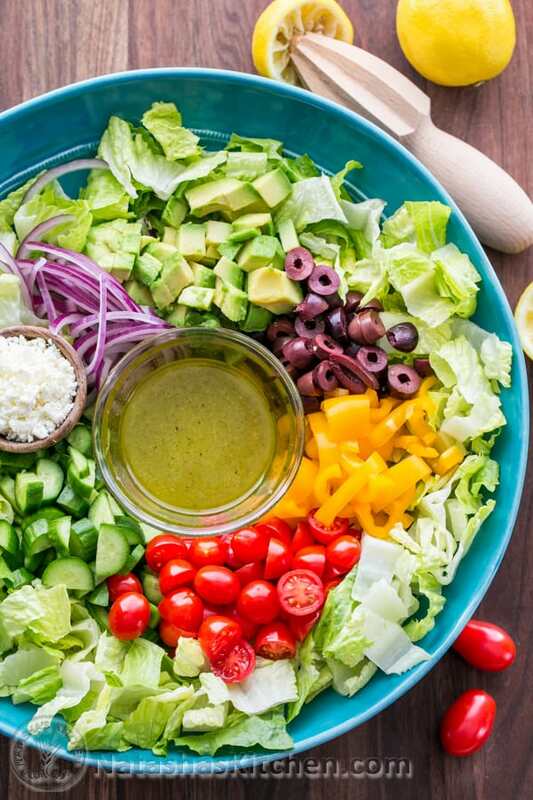 Fresh Greek Salad is a must try and one of the healthiest salads around. 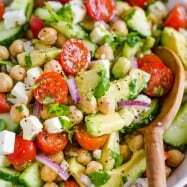 This is chock-full of cucumber, tomato, avocado with tangy-salty bites of olives and feta cheese. 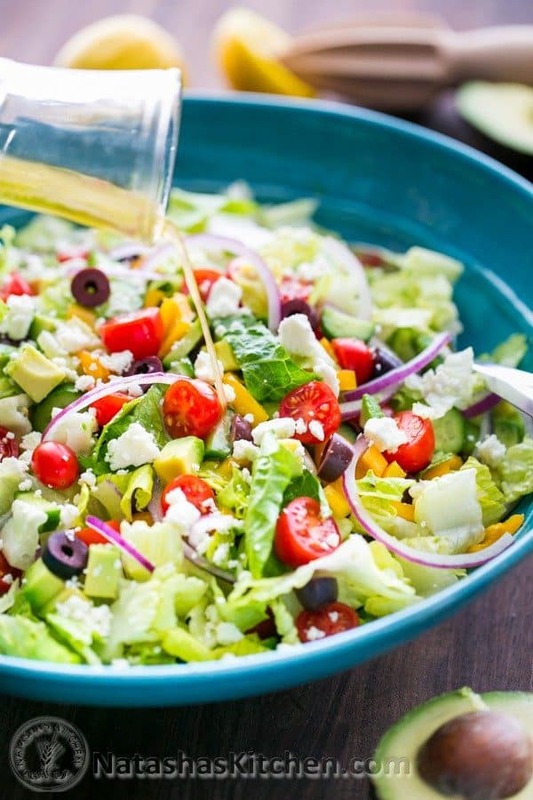 The Greek salad dressing is so easy and flavorful – you will want it on all of your salads! 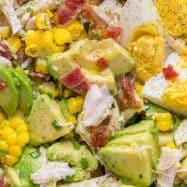 You might recognize it from some of our most popular recipes like Chicken Avocado Salad, this Cucumber Avocado Salad, or healthy Tuna Salad. 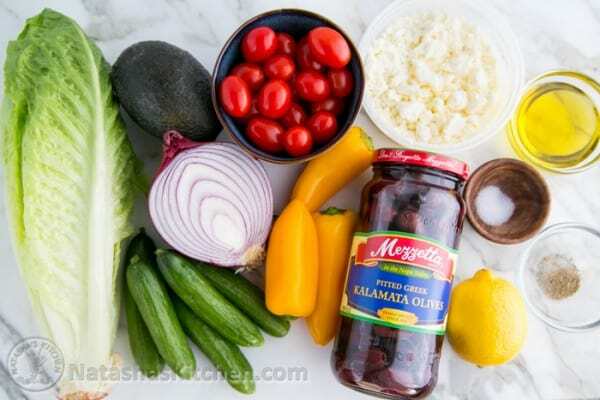 Greek Salad typically combines fresh ingredients like crisp cucumbers, tomatoes, sweet bell peppers and red onion, kalamata olives and feta cheese. The simple lemon, olive oil and garlic dressing makes every bite memorable. This salad is a staple not only in Greece but in the Mediterranean region. Is this a Make-Ahead Salad? For crisp lettuce, rinse your romaine lettuce in cold water, then use a salad spinner (Amazon affiliate link) to dry completely. Refrigerate until ready to use. 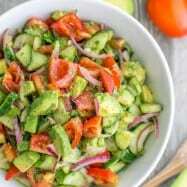 Prep and refrigerate most of your salad up to a week in advance except for tomatoes and avocados which are best added fresh. Add dressing just before serving. The salt in the dressing can cause the salad to wilt. If you love fresh Mediterranean flavors, these are a must try! I could eat this salad all day and not get tired of it. It kind of reminds me of the Olive Garden salad and dressing but it’s 100x better! Seriously folks, go to the grocery store soon for your Greek salad ingredients! 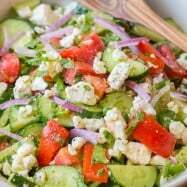 This greek salad is a must try! 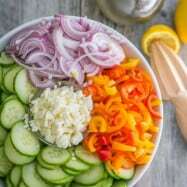 It is one of the healthiest salads around; full of fresh, raw veggies and served with a healthy lemon olive oil dressing. So delicious and guilt free! Rinse, chop and spin dry romaine lettuce and transfer to a large salad bowl. 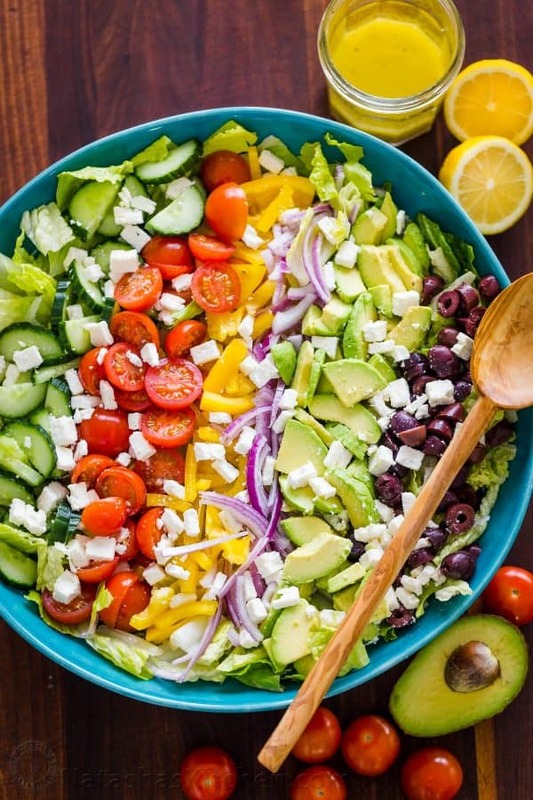 Add remaining salad ingredients to the bowl: sliced red onion, sliced bell peppers, halved tomatoes, diced cucumber, diced avocado, kalamata olives and feta cheese. Combine all Greek dressing ingredients in a mason jar and shake to combine. Just before serving, drizzle dressing over the salad to taste and toss to combine. So good! My husband and son loved it too! Can you imagine yourself eating this? I want this in my mouth now! Hello, love all your recipes. Can I use vinegar (apple cider vinegar) instead of lemon? I can’t eat lemon because of heart burn. im so blessed to see ur blog…and i really thanks GOD for giving me chance to find and watch ur craving recipes…..im ur avid fan..
More power mis natasha be blessed and your family circle. Great recipe, usually this salad is always my to go lunch salad and I do add chicken to it, but I don’t call it Greek salad 🙂 This salad for sure delicious. Sometimes I add on top balsamic vinegar, makes huge difference to it. Extra virgin olive oil cold press makes a huge different to the salad as well. Taste much better. 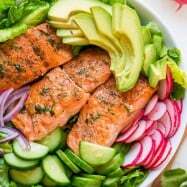 It’s pretty much identical to yours except for the dressing which includes a few more (probably in your pantry already) items that I feel like make the dressing even more flavorful!